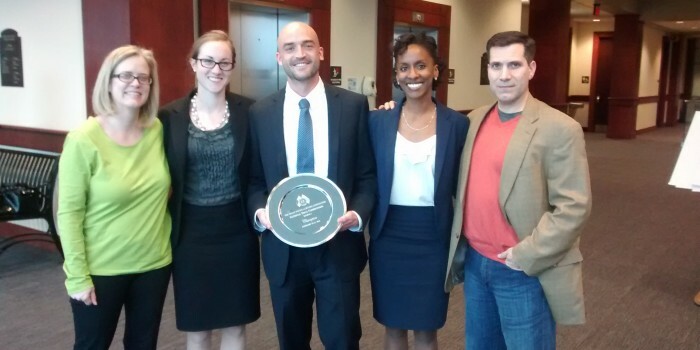 National Trial Team wins Regional Trial Competition in Charleston, S.C.
Wake Forest Law students Jordan Lee (JD ’16), Amanda Parker (JD ’16) and Maria Nkonge (JD’16) were the winners of the regionals of the TYLA National Trial Competition, led by coaches Mark Boynton (JD ’97) and Stephanie Reese (JD ’96). The team now moves on to nationals March 30-April 3. The following is an email sent by Boynton to announce this year’s victory. “The National Trial Team traveled to Lexington, South Carolina, this weekend to compete in the regionals of the TYLA National Trial Competition. Eleven law schools and a total of 20 teams competed over three days. “After three preliminary trials, the field was cut from 20 to eight semi-finalist teams in two brackets that ultimately lead to two winning teams representing the region at nationals in Dallas, Texas, later this semester. Our squad of Jordan Lee (3L), Amanda Parker (3L) and Maria Nkonge (3L) defeated Campbell in the semis and went the distance of five trials to defeat the host school team of South Carolina in the final round while garnering unanimous praise from the judges panels for “flawless” and “magical” advocacy as well as “a level of professionalism which all lawyers could well emulate.” Mr. Lee and Ms. Parker tried the semi-final round while Mr. Lee and Ms. Nkonge tried the final round. “Our squad of Catherine Law (3L), Daniel Stratton (2L) and Steven Franklin (3L) narrowly missed the cut after a deadlocked tie in the third round against the very Campbell team that fell to Wake in the semis. Many of you will recall that Ms. Law took a squad to nationals last year in Houston after winning the region with Kim Sokolich and Jeff Willison. “This year the host asked all judges to rank the advocates in each trial in order to select candidates for five Outstanding Advocate Awards. Both Captains, Mr. Lee and Ms. Law won. To be eligible for the award, a student had to compete in at least two trials during the three preliminary rounds. Ms. Nkonge only sat in one trial during the prelims, however, the host officials went out of their way to let us know that she swept the judges in her round as the best advocate in the room. “Our three alternates, Brad Simon (2L), Lauren Stovall (2L) and Sophia Vazquez (2L) not only performed outstanding work supporting the squads during the competition but were needed to act as witnesses in four rounds. Again, from all corners the coaches, competitors, judges and host officials sought us out to praise our students for intelligent, fair and engaged work as trial witnesses playing numerous rolls over the rounds of competition. “Our pride in and for our team should be obvious but cannot be overstated. This group’s dedication to the art of trial advocacy and to each other sets a standard that Stephanie and I can only hope to achieve each year with each group. Wake Law is truly fortunate to be so well represented year after year by consistently excellent student advocates. “We are grateful to the deans for continuing to give our students these opportunities. Stephanie and I want to thank Professor Anderson, Professor Pocock and Ms. Thach for tremendous support of the team. We cannot do what we do without them. We owe very special thanks to Ann Robertson who even in the midst of tremendous trials of her own continues to prop us up, guide us and keep us quite literally “on the road” to success with unflinching grace.